Eating insects in Bangkok | Love.Food.Asia. 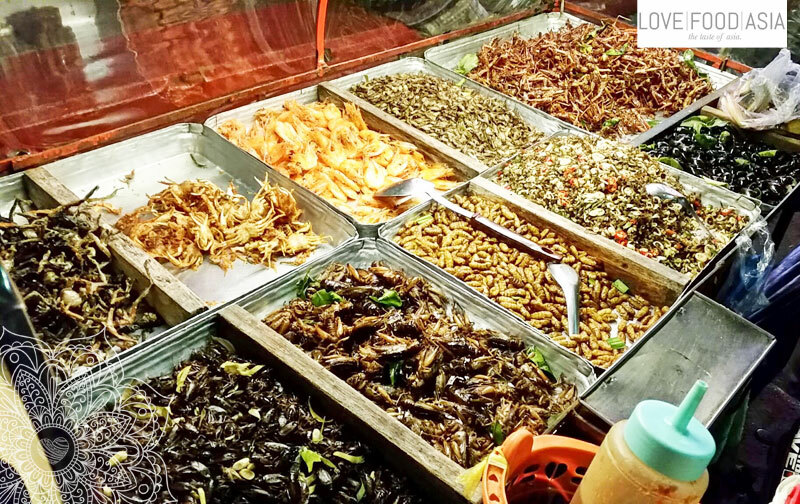 All over Asia it is very popular to eat fried insects but in the Metropolis of Bangkok you can find the most eats on the street in different areas of the city. Around 14 milion People live in Bangkok so you can find lots of cookshops out on the streets. All stomachs want to be filled. Eating insects become more and more popular in Thailand. But the main customers are people from the rural parts of Thailand. When you are out in Patpong at night you can find some cookshops with insects between the flikering lights, prostitutes, Tuk-Tuk drivers and western tourists. They all have differnt kind of insects. Most of them are fried and have a spicy flavor. For western tourists and backpaker the insects may look disgusting but in my oppinion they taste batter than they look. A bag of crisps has a lot in common with a serving of fried insects. They are both tasty, greasy, cheap and are great with beer, but fried insects definitely have an edge over crisps, both in terms of nutritious value and the exotic element. Reblogged this on International Gay Guide To Asia & Cambodia.